Transfer students face a daunting period of adjustment when they arrive at the UW, but results from a new study will help improve their experience. The Transitions Project, led by UW-IT’s Academic Experience Design & Delivery (AXDD), focuses on understanding challenges students face at key transition points in their careers — including their transition to the UW as incoming students, then into a major, and finally into a career. Last spring, the project focused on the experience of transfer students undergoing these transitions. While transfer students experience the same transition challenges as other students, the study found, they do so on a tightly compressed time frame. Many transfer students must adjust to a new campus, often larger and more complex than their previous institution, and immediately begin planning to apply to their major if they were not admitted directly. They are also aware of the need to gain professional experience quickly in preparation for a career after they graduate. 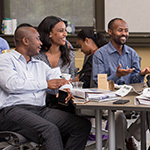 What transfer students may not be aware of, however, is the important role social connections play in making a successful transition. The project found that transfers who had multiple touchpoints with knowledgeable peers and UW staff — advisers, faculty and tutors — also had access to the kind of information critical to successfully navigate complex enrollment logistics, satisfy academic expectations, plan an efficient path to degree and engage in campus opportunities. UW-IT is now working to partner with First Year Programs, Undergraduate Academic Affairs, the Office of the Registrar and the Office of Minority Affairs & Diversity to increase the support transfer students receive, such as improving their access to timely information that will ease their transition experience. This is one of several efforts where AXDD and partners are using research and design methods to help transfer students make the most of their time at UW. Signing up for a personal UW NetID just got easier with a new streamlined process that helps users select their UW NetID, password and related settings quickly and conveniently. New applicants, students, employees and academic affiliates can create their UW NetIDs using the new process on Identity.UW, including simple step-by-step interactions for identity verification, username and password selection, account recovery settings, two-factor authentication enrollment (for eligible users) and email forwarding. UW-IT is continuing to help departments and units adopt the new process, which is expected to improve other outcomes, such as higher rate of self-service account recovery and more reliable delivery of official communications. As the UW nears the one-year mark since Workday go-live, the Integrated Service Center (ISC) has introduced several initiatives to expand its campus engagement efforts, drawing on insight derived from “first time in Workday” events, such as Benefits Open Enrollment and tax season. One such partnership is the newly launched meetings with department Named Support Contacts (NSCs) – administrators who are Workday power-users and are named by their department or unit to serve as the resident Workday expert and direct liaison with the ISC. 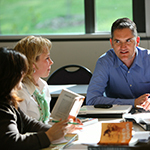 In addition, the ISC continues to support Workday users by co-hosting the bi-monthly Administrators Forum with UW Human Resources, working closely with units to improve reporting capabilities, and communicating updates and posting resources on the ISC website. The ISC has also recently invited leaders from across all three campuses to serve on an ISC Advisory Council charged with helping identify priorities and driving improvements. After a successful pilot with the Foster School of Business, a new Enterprise Service Desk (ESD) offering by UW-IT is now available for IT departments in schools, colleges and administrative units. The service provides a single point of contact for email, telephone calls and email routing, 24x7x365 support, and many other services. Balaz also highlighted the tight partnership with UW-IT that made the pilot so successful. “We formed a strong work relationship and felt as if we were all one team seeking to do the best for Foster School,” he said. The service offers several distinct advantages. Customers of departments that sign up can expect to reach an ESD representative any time of the day or night, any day of the year. Depending on the nature of the call, the issue may be resolved on the spot or escalated to one of the departmental service teams, said Damien Koemans, director of Customer Service & Support in UW-IT. 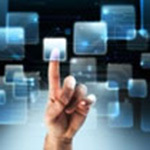 ESD is being offered to clients who already are customers of UW Connect Service Management. To find out more or sign up, email help@uw.edu for a consultation. Read how the Evans School and its partners used easy-to-use technologies to build a successful long-distance program for African Health professionals — the first article in a series about Innovators in teaching and learning. 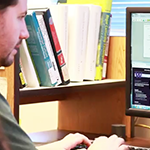 The articles are produced through a collaboration of the Office of the Provost and UW-IT. The FY 2019 Technology Recharge Fee (TRF), which provides essential information technology services to the UW, will increase slightly for fiscal year 2019, with no changes to the lineup of basic services. $57.28 per month per capita for all academic and administrative units. This represents a 2.1 percent increase over the current rate of $56.13. $52.20 per month per capita for the Medical Centers. This represents a 1.7 percent increase over the current rate of $51.34. 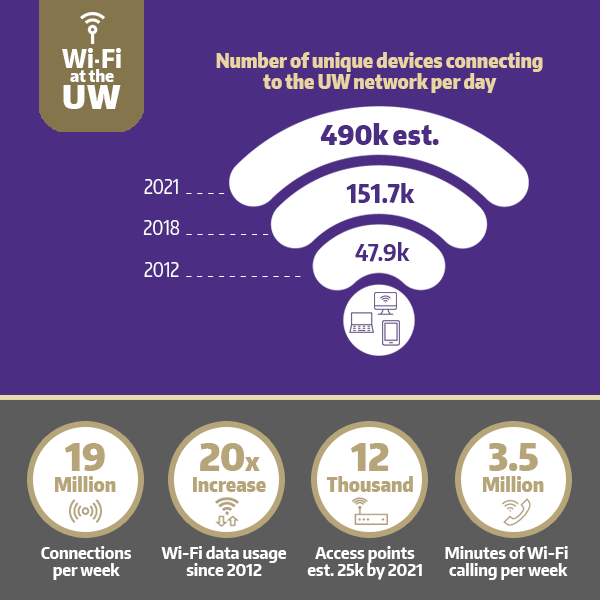 UW-IT has been engaged in a multi-year effort to upgrade the UW’s Wi-Fi network at all of its facilities and campuses — with the goal of a seamless indoor/outdoor experience for students, faculty and staff. June 15 deadline for Catalyst Tool participants: Select Catalyst Web Tools — Collect It, CommonView, GoPost, QuickPoll, UMail and WebQ Quiz — will not be available for participants starting June 15. If you own one of these tools, you have until August 24 to migrate Catalyst content. A relaunched Public Profiles is now easier to use, with timely refresh cycles for a set of dashboards that bring users an accurate view of student data, including trends for enrollment and degrees, and rates for undergraduate retention. Start using the new MyUW by June 14: The legacy MyUW portal will no longer be available as of June 14, so opt in to the new MyUW at my.uw.edu/choose/new. New features recently added to MyUW for staff make access to UW resources easier and more visible. New Course Dashboard improves student engagement: MyUW’s new Course Dashboard provides valuable data to help instructors improve teaching and learning. Faculty can participate in a research study to help improve the dashboard by emailing help@uw.edu. Recent updates to MyUW provide a simple, transparent experience to students enrolled in courses with UW’s Continuum College (UWC2). Now, students can see a visual schedule of UWC2’s many off-term courses. UWC2 students can begin online registration on MyUW, and see their financial balance and navigate to the new payment portal. With these MyUW changes, and the success of UWC2’s online registration/payment project, students are conveniently guided to register and pay online. Can’t find the latest email announcement from UW-IT? Check out our new UW-IT Announcements page in IT Connect to ensure you can find the information quickly. Secure University Data: Protect your UW NetID password, personal information and University data by learning three common email tactics used by cybercriminals to infiltrate systems and networks and how to avoid them.